When young Americans complain they can't find a decent job, ask them a simple question: Who have you called or written to lately? Steve Jobs is a legend for what he did at Apple (AAPL). But even legends have to get their start somewhere. 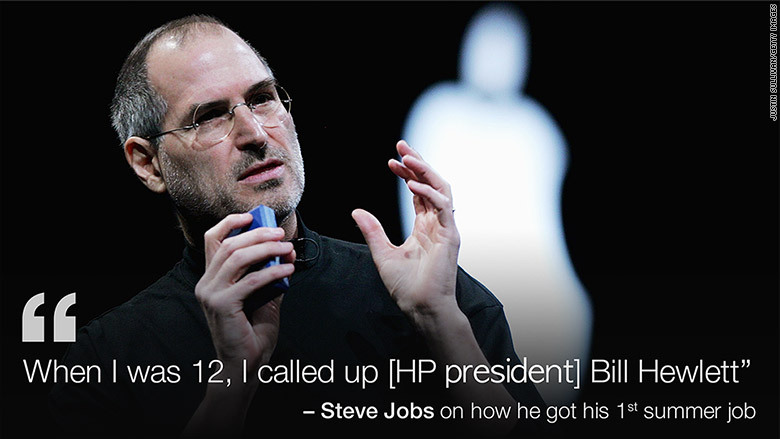 "When I was 12, I called up Bill Hewlett," the president of Hewlett-Packard (HPQ), Jobs said. Join CNN Films for the TV premiere of "Steve Jobs: The Man in the Machine" on Sunday, January 3, at 9 p.m. ET on CNN and CNNgo. Hewlett answered the phone himself, and Jobs recalled telling him: "Hi, I'm Steve Jobs. You don't know me, but I'm 12 years old, and I'm building a frequency counter and I'd like some spare parts." The conversation lasted a few minutes. Hewlett gave Jobs the parts -- and a summer job at HP. "I'll never forget it as long as I live," Jobs said in a 1995 interview. It enabled him to see the first desktop computer ever made. The problem now isn't so much that America's 20-somethings can't get jobs, it's that they can't get the jobs they actually want. Over 44% of recent college graduates are underemployed, according to the New York Federal Reserve. That means that despite earning that college degree, they're working in jobs that don't require that qualification. People who do a lot of hiring say 21 and 22-year-olds just don't get it. They fire off resumes online without much thought. That's not how people who landed coveted jobs got them. "Leverage the networks that you have," says Tuan. 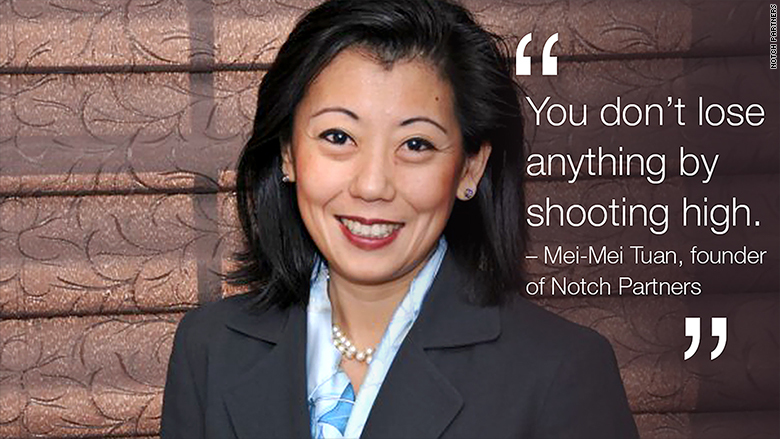 "You don't lose anything by shooting high." It was a brief letter, but it was sincere -- and aimed at the top. "For every person we hire, we probably look at 100 resumes," says Tuan. The people who have stood out the most to her over the years are those who really took the time to learn about the company -- and say how they could add value. Andy McFee is another person who's been "really lucky" in landing a dream career. He's the chief referee on the European Golf Tour. "I took a different path. I've been very very fortunate to watch a game I absolutely love right at the front seat," says McFee. He's walked the world's greatest golf courses alongside Tiger Woods, Phil Mickelson and Rory McIlroy, among others. 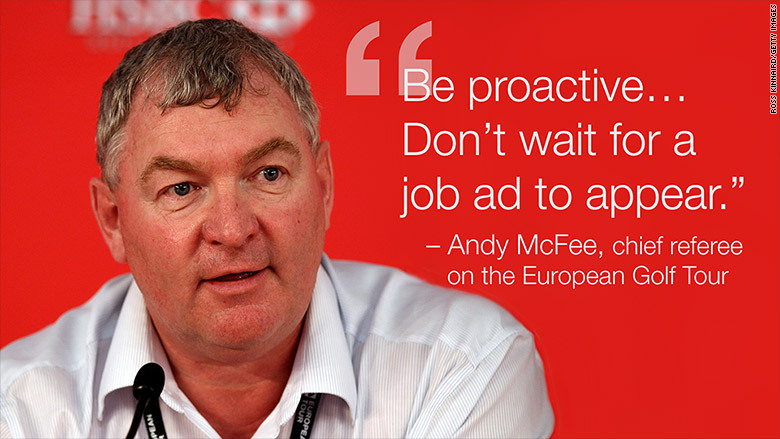 "If you know there is something out there and you want to be a part of it, be proactive," says Andy McFee. "Don't wait for a job ad to appear." It's easy to claim the life stories of Steve Jobs, Mei-Mei Tuan and Andy McFee couldn't happen today. But just because smartphones and emails have replaced typewritten letters doesn't mean that actually writing a smart missive or calling someone at the top isn't the way to go. Matthew Ross is the author of the "brutally honest" cover letter that became famous on Wall Street in 2013. When he wrote to an executive at Duff and Phelps to ask for an internship, he said he "won't waste your time inflating my credentials, throwing around exaggerated job titles, or feeding you a line of crap about how my past experiences and skill set align perfectly for an investment banking internship." The reality is hundreds of people apply for any job posted online. There's a lot of competition. The New York Fed estimates there are 270,000 unemployed recent college graduates and about 2.3 million underemployed recent college grads. "Apply to fewer jobs, but be more thoughtful about why you're applying and what you're going to say," recommends Tuan.